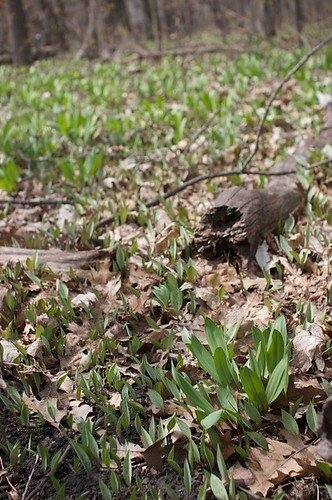 Green things sprouting all over the forest bed--a common enough sight at this time of year, but look closer. Early spring is the time for wild leeks, the pungent plant with boat-shaped leaves and beautiful white stems tinged with purple. They push aside the thick layers of fallen leaves from last autumn and spread like wild fire in sandy, moist areas in partial shade. (Some of them punch holes through tough oak leaves--what vitality.) They grow in such large colonies that, in some areas, an entire forest dons a faintly appetizing smell of garlic. 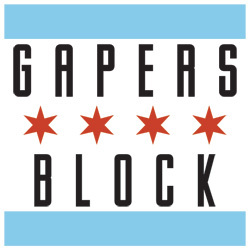 I don't know if it has been an unusually good year, but Chicago seems to be impressively true to its etymology this year. 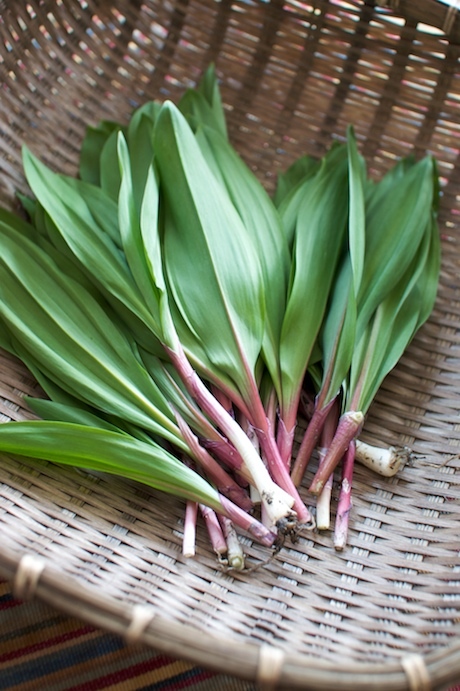 Wild leeks (also known as ramps) are so bountiful in the forest preserves near me that I've been able to experiment with the pungent plant in my cooking. 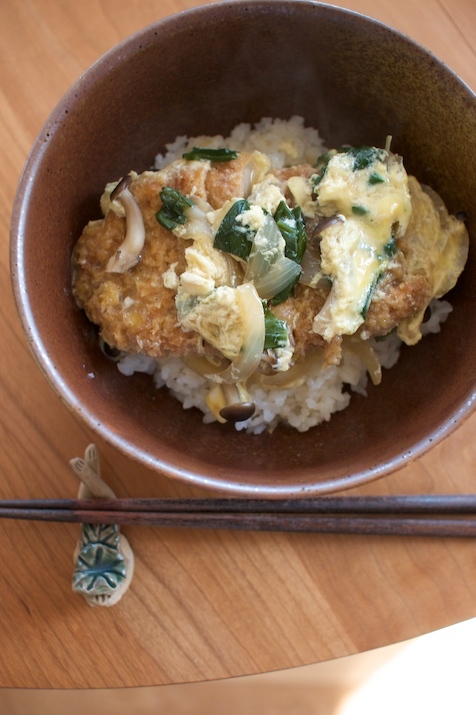 Katsudon: Panko-breaded pork, wild leeks, onion, egg, rice, Japanese broth. 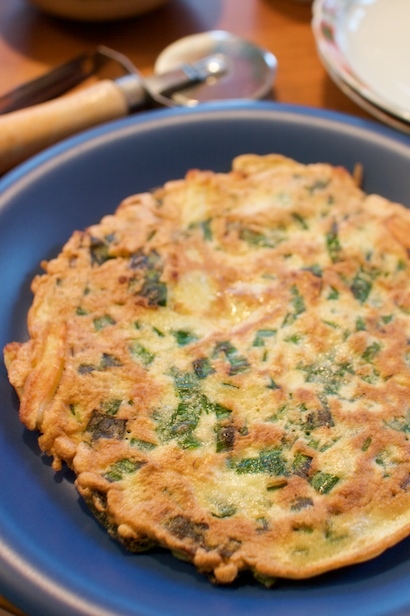 Buchimgae (Korean pancake): squid, wild leeks, egg, flour, rice flour, sesame oil. 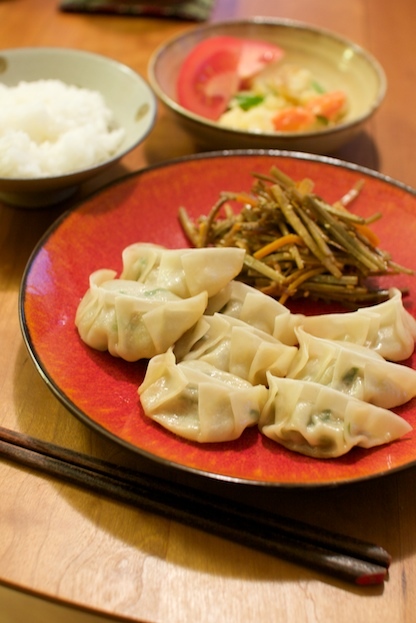 Gyoza: pork, wild leeks, green onions, ginger, soy sauce, oyster sauce, black pepper, sesame oil, gyoza wrapper. For the record, I also did tempura, which was probably the most fantastic of the preparations--tastewise. The problem? As the wild leeks heated in oil, they puffed up and then bursted, sputtering the scorching-hot oil everywhere. Worse yet, the batter slid right off the smooth surface of the leeks, leaving the whole thing look like tired green fairies with soggy robes sliding off their shoulders (very unphotogenic). But the intensely garlicky flavor was wonderful; the wild leeks do seem to taste better when flash-cooked in oil. Perhaps cutting them up before deep-frying--like Indian pakoras--might be the solution. Though the season may be ending soon (our last harvest had a much weaker aroma and was starting to lose their tenderness), there's probably still a few days, perhaps a week, to catch the tail end of it. If I get another chance, I might try the pakora-style wild leeks. Meanwhile, this page has good information on how to find and identify wild leeks.